Can I use McKinsey PEI stories from some years ago? A general rule of thumb is around 2 years. As an interviewer, I am not really that much interested on how you behaved in a specific situation many years ago. Why? Because I assume you did some meaningful stuff meanwhile, which also helped you/your personality to advance. So looking at an example from many years ago will not give me an accurate picture of your today’s skills and personality. Additional note: The time-frame is slightly less critical for the Entrepreneurial Drive dimension, since it’s less focued on interpersonal skills, which are more subject to experience and more recent developments. 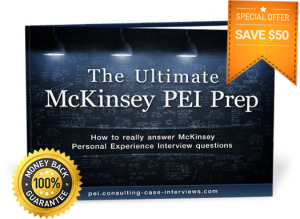 Do my McKinsey PEI stories need to be related to work experiences? All other factors being equal, I recommend using work-related examples if you have any. Work-related means from a recent full- or part-time job (young or experienced professionals), or also from an internship (students). However, it’s clear that as a student you are oftenly not in a position to demonstrate those aspect in Leadership, Personal Impact or Entrepreneurial Drive which are relevant for McKinsey. But if you have an example from your internship in which you can demonstrate the relevant aspects, please use it! Why using work-related PEI stories at all? It’s much easier and clearer for an interviewer to mentally transfer another work-related example into the context of a McKinsey engagement, to better understand your actions and decision-making rationale in a specific situation. In case you have other potential examples which you consider much stronger, than at least you can offer both of the examples to the interviewer and let him decide, what he considers as more relevant! Next Next post: I failed in my previous McKinsey PEI – when can I re-apply?